St Michael’s Church, Stockwell Park Road, a Grade 2 listed church by W. Rogers, was constructed in 1840-1 in the Gothic Style. 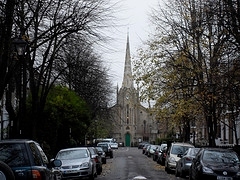 The building was originally planned with the sanctuary beneath the spire and the main entrance was from Stockwell Park Crescent. The orientation was changed in 1880 when the altar was moved and the space under the tower became the main entrance and porch. The walling is generally built of brick with buff coloured Suffolk bricks used on the west elevation and stock bricks on the side and rear elevations. The tower is constructed in stone and there are stone copings, cills, kneelers, string courses, finials, hood moulds and other details. The accommodation comprises nave, aisles, a wide chancel and vestries at the east end on the south side. There are galleries above the aisles. Access to the galleries is via separate staircases with external entrances. The galleries are supported on slender iron columns and cranked iron beams. At the west end there is a flower room, workshop, porches and lobbies. Above the main central entrance lobby is the tower and spire. The site for this church was freely given in 1839 by William Cox to the Commissioners appointed by the Act of 1818 for building additional churches in populous parishes. William Rogers’ design for the church was approved early in 1840, and to ensure that the building would be “substantially and honestly executed” Rogers was careful not to bind the Commissioners to accept the lowest tender. John Jay, of London Wall, was the builder selected, the estimated cost being £4,819 16s. 4d. (including commission, and salary for a clerk-of-works), of which sum £2,000 were to be provided by the Metropolitan Churches Fund. The building was consecrated by the Bishop of Winchester on November 18, 1841, and a district was assigned in 1845. The church as originally designed consisted of a wide nave with galleried aisles to the north and south, flanked by side chapels. An apsidal extension at the west end now forms the chancel, but the altar was originally placed within the arcaded base of the hexagonal steeple at the east end, being almost obscured from the congregation by the high pulpit. The steeple, placed axially with Lorn Road, is flanked by small vestries and octagonal lobbies added shortly after the completion of the building. In 1880 a faculty was obtained to re-orientate the internal arrangements. The altar was then transferred to the west end, the porch there being demolished and the doorway built up. Open pews replaced the box pews and the west gallery was removed, the organ being re-erected in the south aisle. There are two inscribed tablets set in the tower buttresses. The first records the renewal of the pinnacles and the repair of the exterior in 1896, and the second records the internal renovation of 1920, carried out by the architect A. R. Powys. The church was severely damaged by a flying bomb in June 1944 and after its restoration by Thomas F. Ford was re-dedicated in 1952. In every respect this is a typical Commissioners’ “Gothic” church—that is to say, a capacious preaching-box with galleries, built of brick and meagrely dressed with stone detail of a wiry Early English character. Architectural interest centres on the east elevation, closing the vista along Lorn Road. This is a symmetrical composition balanced about the tower and spire of hexagonal plan, one half of which projects beyond the east wall of the nave. Each face of the tower is gabled and contains in its upper part a group of three lancets, one large glazed light between two blind arches. The angles are emphasized by offset buttresses rising to octagonal pinnacles. The present somewhat abrupt transition from tower to spire is due to the removal, in 1930, of the flying buttresses and inner ring of pinnacles at the base of the spire. Each flanking face of the nave wall contains a lancet group similar to those in the tower, and the parapet is sloped to accord with the roof pitch. The east end of each side chapel was treated as a low tower with an arcaded top stage and corner pinnacles, but these embellishments have been removed. The interior has a spidery elegance due to the use of slender shafted columns of cast-iron for the arcades supporting the galleries and roof. The structural timbers of the roof were originally exposed but they are now concealed by a false ceiling. The windows of single lancet form generally have clear glazing, the exceptions being the five windows of the apse and the west windows in the side chapels. The stained glass for these was designed by John Trinick. The church, dating from 1841, survived extensive damage from a flying bomb in World War II. The bomb damage resulted in the area opposite the church being cleared for Slade Park (now a children’s adventure playground).